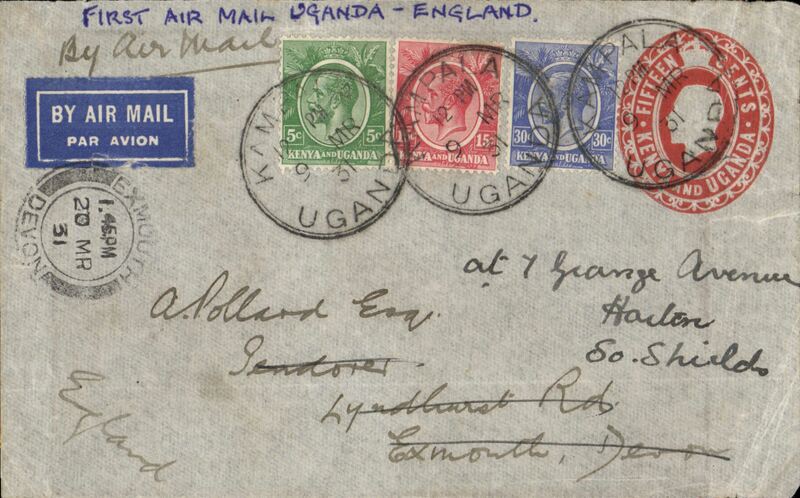 East African Experimental Air Mail service by T.A.Gladstone, Jinja to Nairobi, 14/2, via Kisumu 12/2, red double ring Uganda cachet insead of normal postmark and also red "Keyna-Sudan Air Mail Fe 12" cachet verso, a combination unique to this stage of the flight. Newall quotes only 4 flown. A fine and rare item in pristine condition - exactly as illusrated in Newall, page 85. 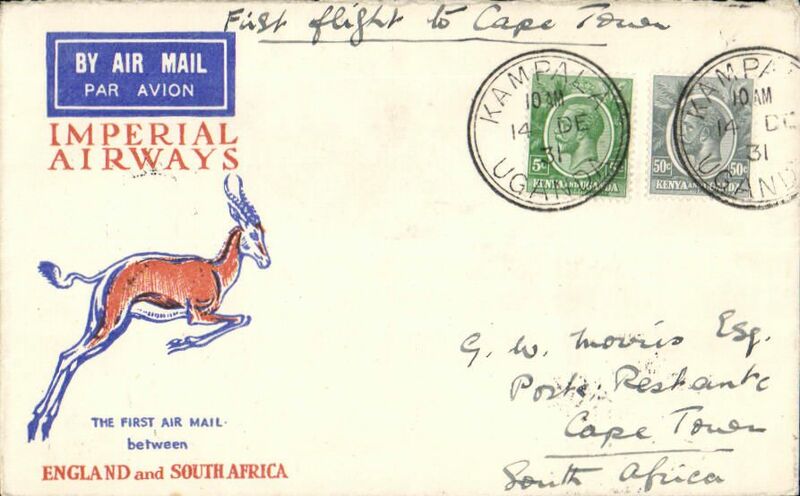 A similar cover realised £550 plus 15% commission at Harmers, London, May 1997. 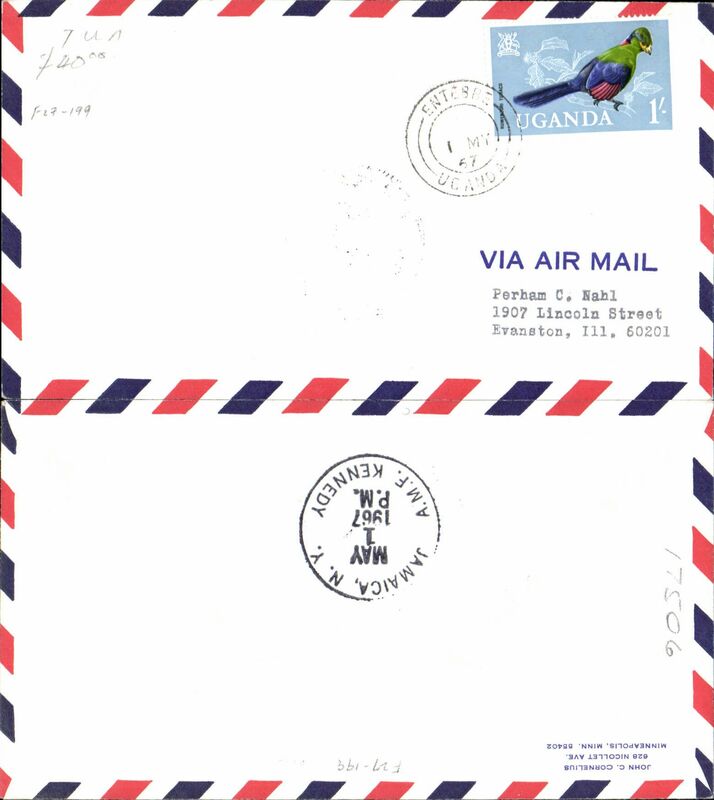 Uganda to UK, carried on the opening of the regular Khartoum-Kisumu-Khartoum service, airmail etiquette cover franked 70c canc Entebbe cds, via Cairo 5/3 transit cds, red circular 'Kenya-Sudan/FE 27/ 27/Air |Mail', Newall 80 units. Image. 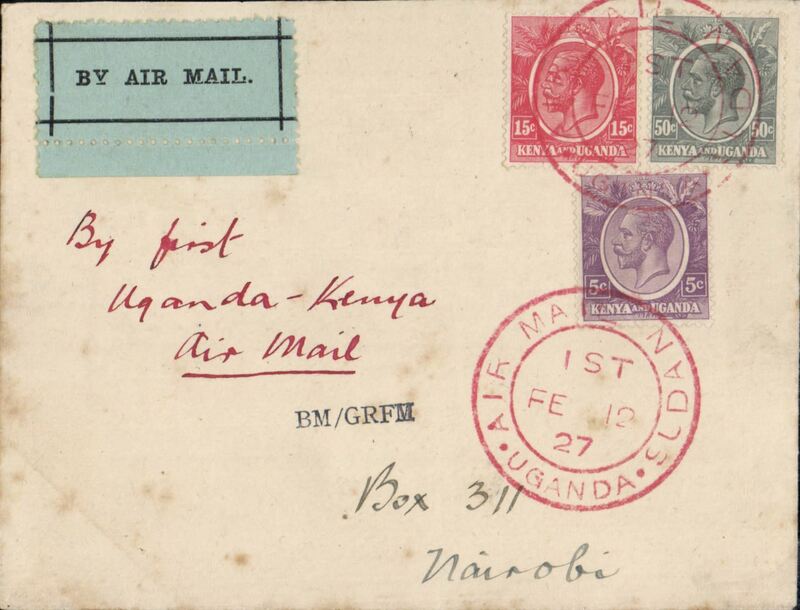 Uganda to UK, carried on the opening of the regular Khartoum-Kisumu-Khartoum service, airmail etiquette cover franked 70c canc Jinja cds, via Cairo 5/3 transit cds, nice strike red circular 'Kenya-Sudan/FE 27/ 27/Air |Mail', Newall 80 units. Image. 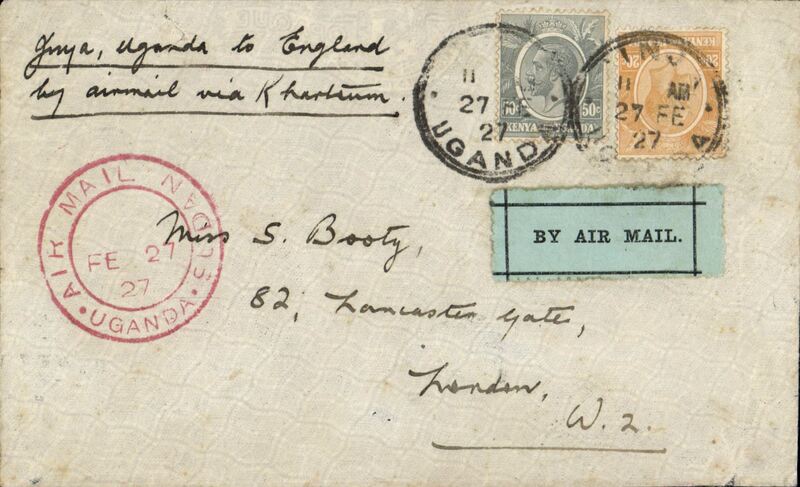 F/F Kampala (Port Bell) to Mwanza, bs 16/3, via Kisumu 10/3, carried on the inaugural London to East Africa service, official "map" cover, Imperial Airways. Unloaded at Kisumu by mistake and completed journey on second southwards flight.162 flown Kampala to Kisumu. 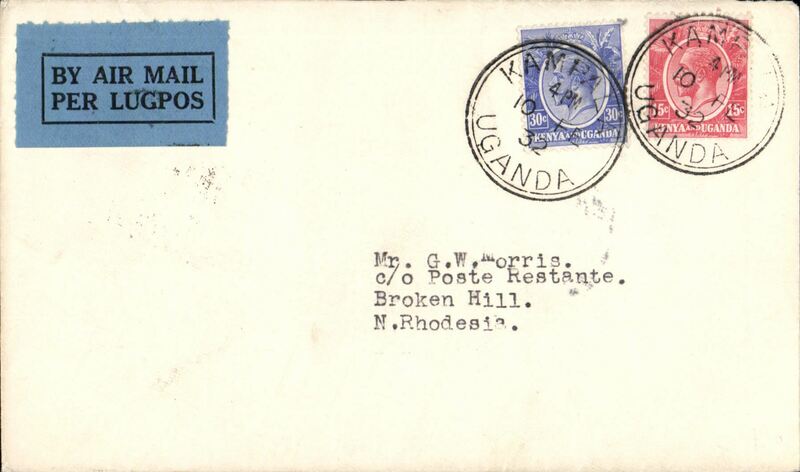 F/F Uganda to England, Kampala to London, 20/3 arrival ds on front, 15 c PSE with additional 50c (correctly rated 65c). Left Port Bell on 11/3. 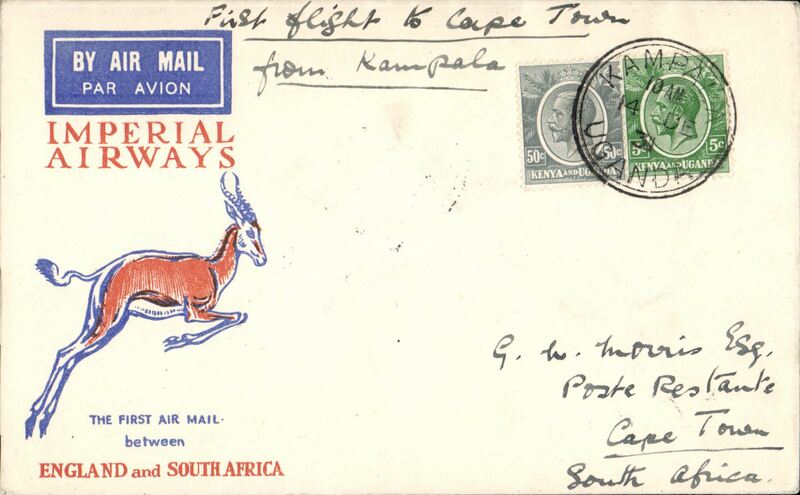 An example of an uncommon intermediate stop (Kampala) on the London- Cape Town service, Kampala-Broken Hill, bs 14/2, plain cover franked 45c. 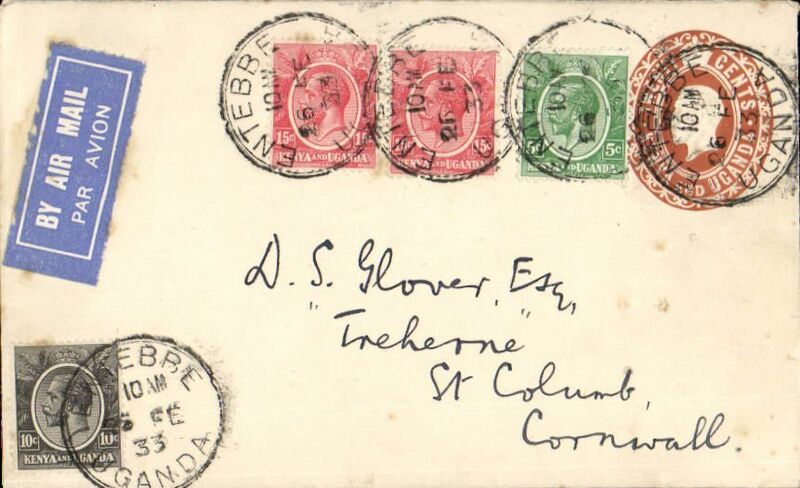 Entebbe to London, bs St Columb, Cornwall 7/3, 20c PSE with additional 45c canc Entebbe cds, ms "By 1st Direct/Entebbe-London/Air Mail despatch". 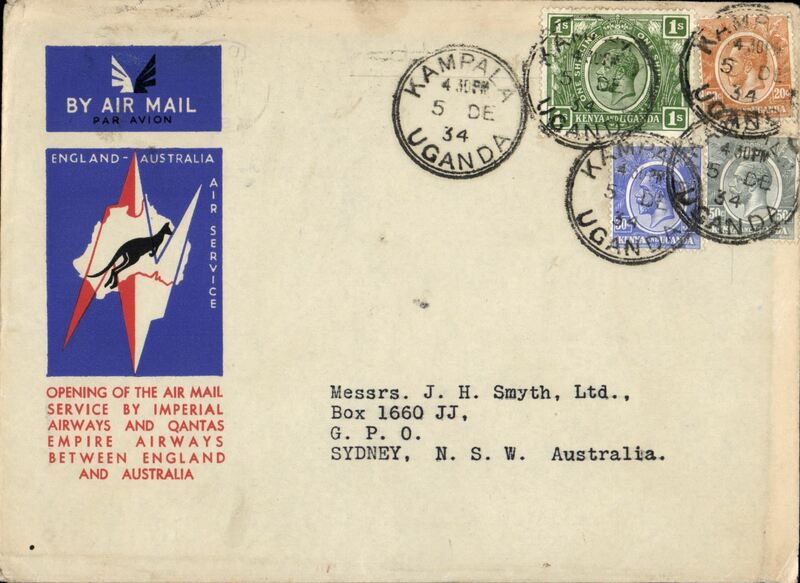 Uganda acceptance for the first regular weekly service from England to Australia, Entebbe to Darwin, bs 19/12, via, via Cairo 10/12 transit cds, official blue/black/white souvenir "Kangaroo" cover, franked 1s 90c canc Kampala cds, Imperial Airways/Qantas. A super item. 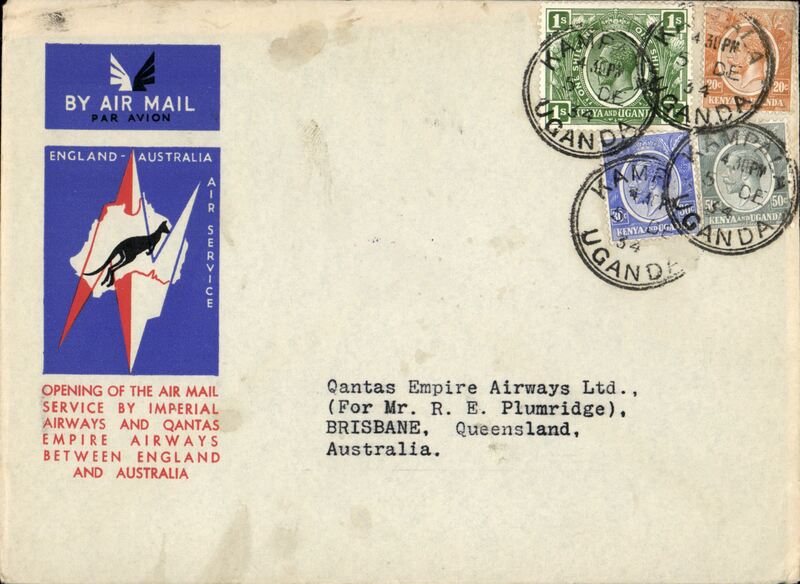 Kampala to Australia, bs Brisbane 21/12, first acceptance of African 'all the way' airmail for Australia for carriage on the Imperial Airways African service to Cairo 10/12 transit cds, to connect with the first extension of the IA/ITCA/Qantas service from Singapore to Brisbane, official 'Kangaroo' cover franked 2/- canc Kampala cds. Scarce. 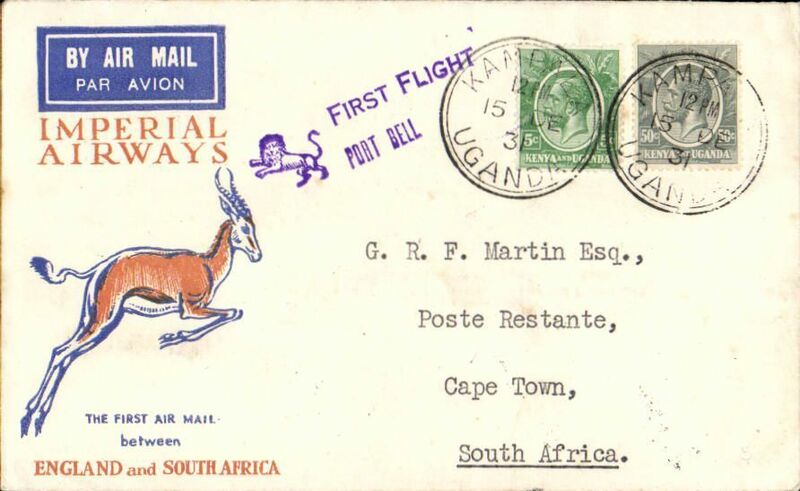 Kampala to Sydney, bs 21/12, via Cairo 10/12, 2, official 'Kangaroo' cover franked 1/- & 60c, first acceptance of African 'all the way' airmail for Australia for carriage on the Imperial Airways African service to Cairo 10/12 transit cds, to connect with the first extension of the IA/ITCA/Qantas service from Singapore to Brisbane. 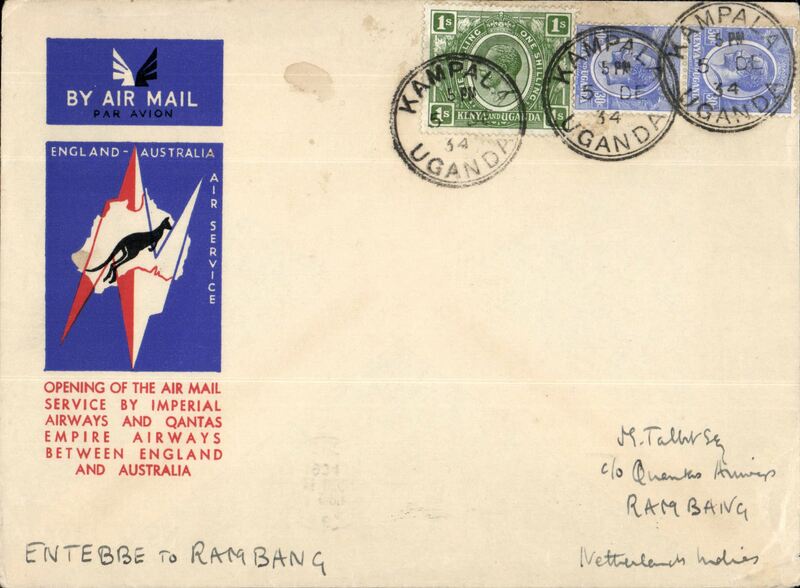 Addressed to, and correctly franked for, Rambang, NEI, but overflown to Sydney. Scarce. 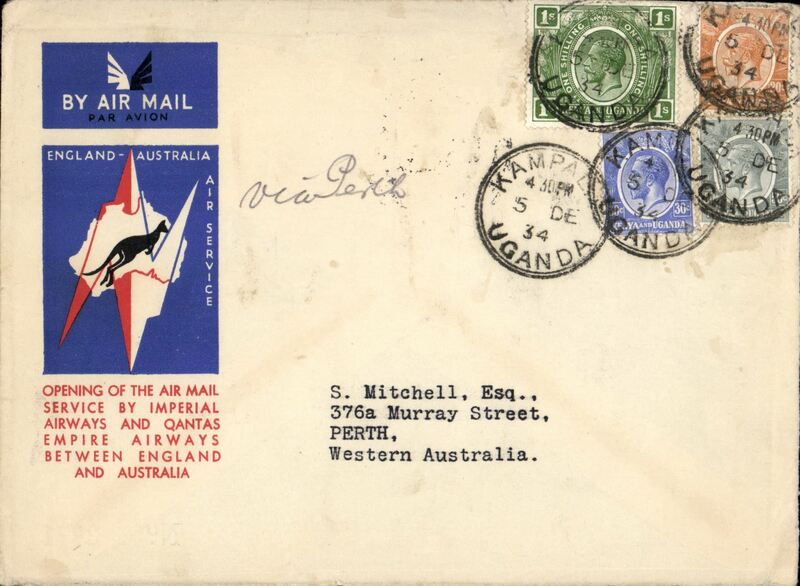 Kampala to Australia, bs Melbourne 22/12, first acceptance of African 'all the way' airmail for Australia for carriage on the Imperial Airways African service to Cairo 10/12 transit cds, to connect with the first extension of the IA/ITCA/Qantas service from Singapore to Brisbane, official 'Kangaroo' cover franked 2/- canc Kampala cds. Scarce. 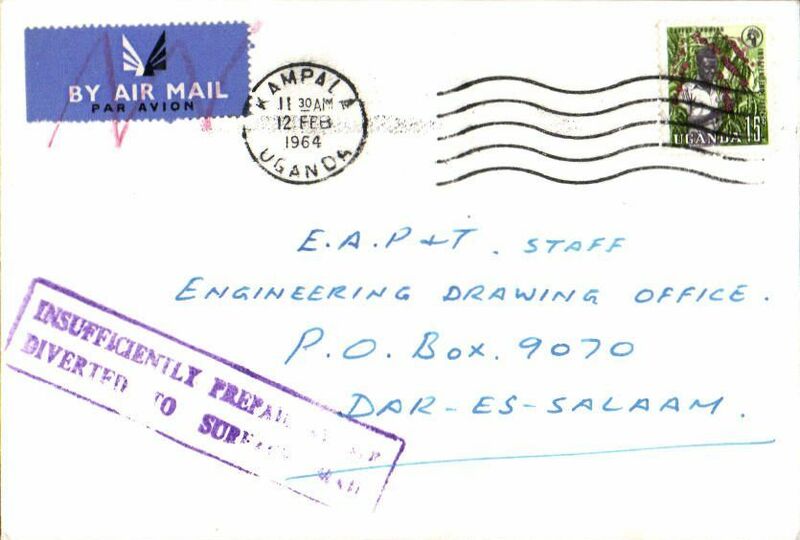 Kampala to Dar es Salaam, no arrival date, cover franked 15, airmail etiquette cancelled in red, purple framed "Insufficiently Prepaid 'For Air'/Diverted to Surface Mail". 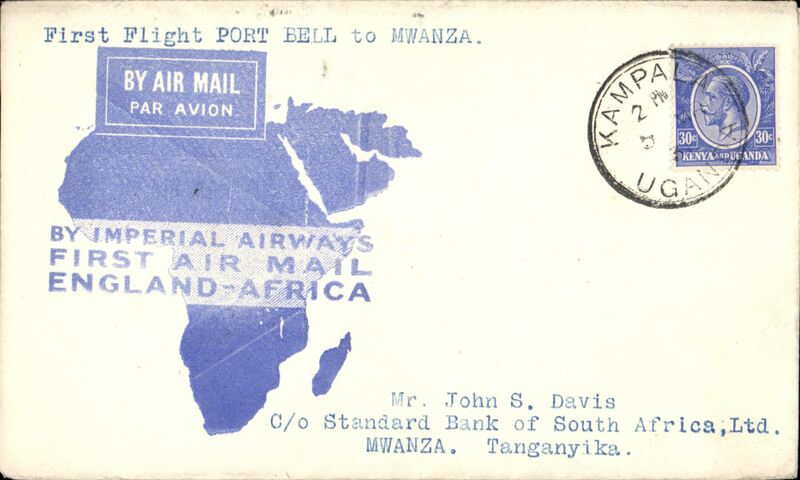 TWA, F/F FAM 27 Extension to East Africa, Entebbe to New York, no cachet, b/s, 66 flown, AAMC #F27-199, cat $55. 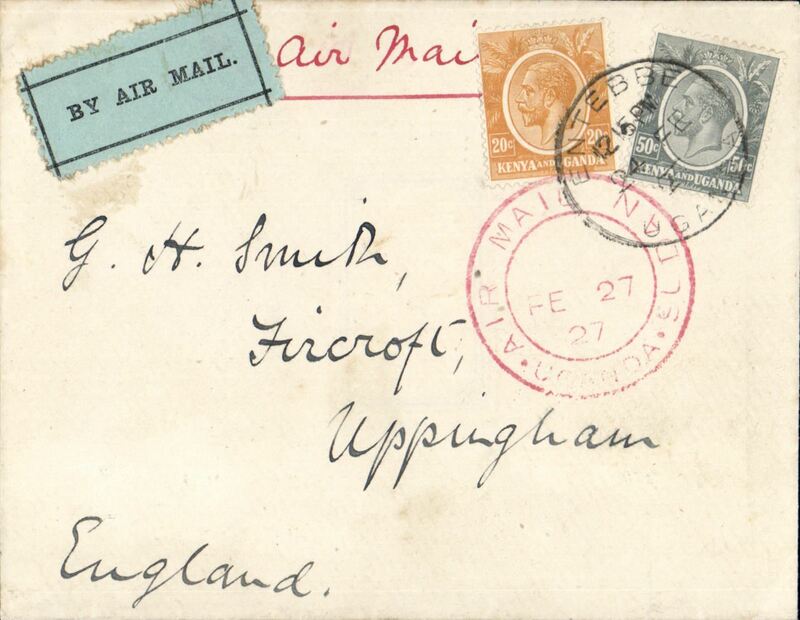 Air India, F/F Entebbe to Bombay, bs 1/11, attractive souvenir cover franked 1/- + 30c, official F/F cachet.